In a new study, researchers from the U.S. Department of Energy’s (DOE) Argonne and Brookhaven National Laboratories observed the formation of two kinds of defects in individual nanowires, which are smaller in diameter than a human hair. In Bragg ptychography, researchers shine an X-ray beam at a series of overlapping spots all over the material, like a stagehand slowly moving a spotlight across a stage. The information produced by the atoms’ scattering of the X-rays gives researchers a three-dimensional view of the material at close to atomic resolution. The researchers used the technique at Brookhaven’s Hard X-ray Nanoprobe at the National Synchrotron Light Source II (NSLS-II), a DOE Office of Science User Facility. Scientists have recently improved the algorithms that generate this picture, an improvement that has dramatically changed the X-ray information collection process. Instead of having to use a spot-by-spot grid-based approach as done in earlier ptychographic studies, Hruszkewycz and his collaborators could move their X-ray beam around more freely, collecting useful information from across their sample. ​“It’s like instead of doing a very simple and repetitive line dance, all we have to do is make sure that we place our feet on each part of the dance floor at one point or another,” he said. This flexibility has another advantage: it allows researchers to illuminate smaller features using a smaller spot size — enabled in large part by X-ray zone plates fabricated by Michael Wojcik, a physicist at Argonne’s Advanced Photon Source. These zone plates are a diffractive optic that consists of several radially symmetric rings, called zones, which alternate between opaque and transparent. They are spaced so that light transmitted by the transparent zones constructively interferes at the desired focus. 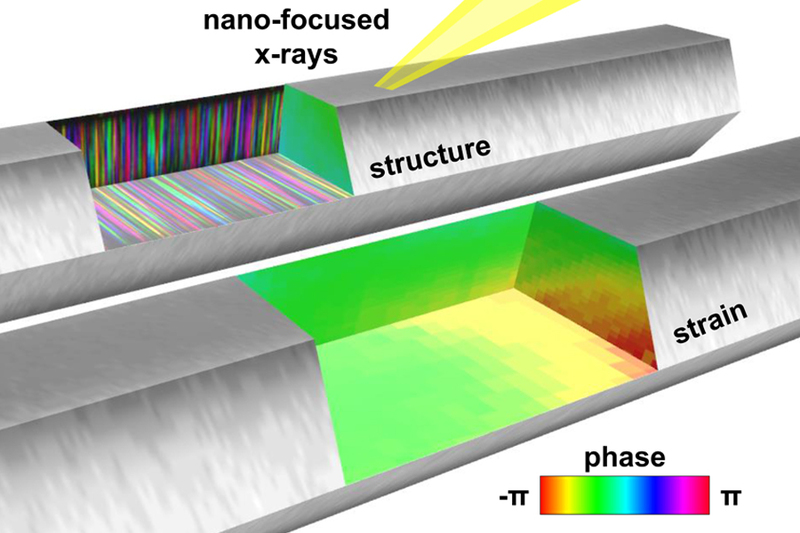 An article based on the study, ​“Measuring three-dimensional strain and structural defects in a single InGaAs nanowire using coherent X-ray multiangle Bragg projection ptychography,” appeared in the January 18 online edition of Nano Letters.